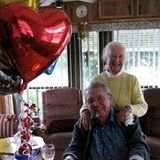 Born June 9, 1930, Harry died in White Rock on February 10, 2016. He started his journey to a UBC doctorate degree in 1966 at the age of 36 with his wife, May, and his four children: Garth (deceased 1988); Kevin, BEd’83; Kerry, BPE’82, MALT’05 (Royal Roads); and Patrick. He received his first two degrees at the University of Alberta. We were all inspired by his studies (BCom and MEd) and his career as executive director of the BC School Trustees from 1973‑1989. Most of all, his partnership in marriage with Mary Telford (May) for over 64 years showed us that love can propel changes in life that go from air raids and surviving a direct hit in Belfast, to a nine‑month separation as they immigrated to Canada, and even through an educational journey that changed the lives of educators and children in BC and beyond. Learning in our family continues with his six grandchildren: Jamie Armstrong (BA and MA), Kyle Armstrong (BA), Brennan Hall (BA), Sarah Hall, Maegen Armstrong and Brittany Armstrong (all three girls continuing in post‑secondary education). Harry, a great teacher, taught us about faith, hope and love. With the gift of love, even if we are not together physically, we are together, which gives us the hope we need to carry forth not for ourselves alone – to love, to transform ourselves and others.